Keep pace with what matters in Governance. Companies can use QualityScore to identify areas that investors may see as presenting governance-related risk and to inform their governance and compensation decisions. The QualityScore offering for issuers provides premium tools to help companies stay abreast of emerging standards, peer practices, and shareholder priorities. Premium users can benchmark their practices against peers and model the impact of potential changes in their governance structure, thus gaining actionable insight on how to improve their governance practices and QualityScore rating. Please provide registration details in order to access the free search tool. Search for a company’s QualityScore and identify possible investment concerns based on governance risk signals. Access to the search function is temporarily unavailable as ISS begins the QualityScore launch process. Updated scores will be available beginning November 21st. Governance isn’t a one-size-fits-all proposition. Industry, company size, peers, ownership, shareholder base, and other factors can influence the governance decisions a company should make. ICS’ expert advisory team understands these nuances and how to construct the right recommendations for you and your shareholders. 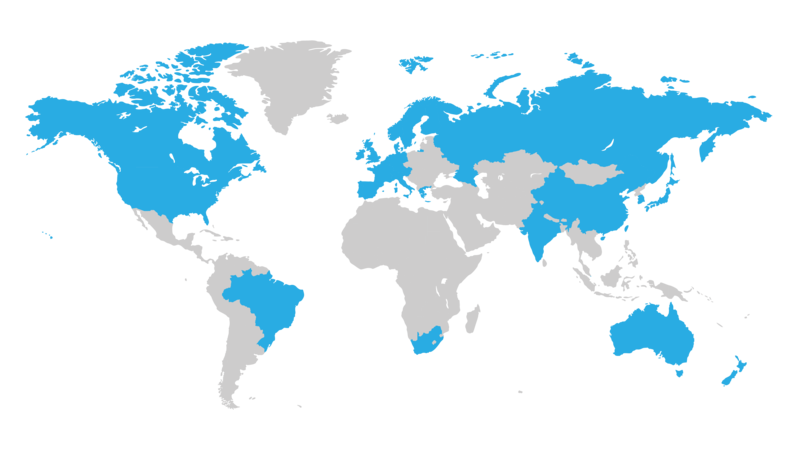 The QualityScore coverage universe encompasses 5,600 companies in 30 global markets, including the largest 3,000 corporations in the U.S. The ISS Governance QualityScore Technical Document details the questions analyzed and rationale for inclusion in the factor methodology. Companies receive an overall QualityScore and are also assessed across four pillars: Board Structure, Compensation/Remuneration, Shareholder Rights and Takeover Defenses, and Audit & Risk Oversight. 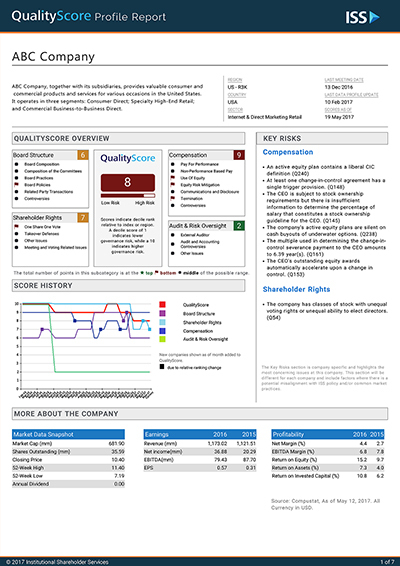 QualityScore uses a numeric, decile-based score that indicates a company’s governance risk relative to its index or region. 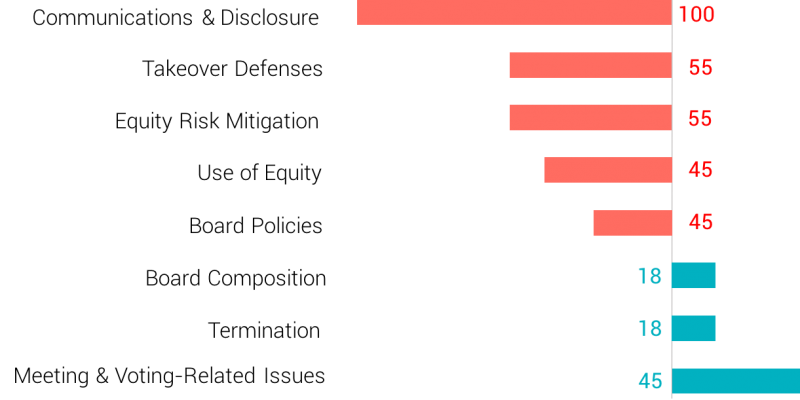 A score of “1” indicates governance risk in the lowest 10 percent of all companies, and, conversely, a score of “10” indicates governance risk among the highest 10 percent of all companies. Due to the relative nature of QualityScore, both events involving a company and events at other companies in its region may affect a company’s QualityScore. Review, verify, and provide feedback on the data used to determine the ISS Governance QualityScore. Benchmark governance risk & uncover opportunities to maximize your appeal to investors.